Botto village with its 2,144 inhabitants is located at the Gulf of Bone in Wajo district in South Sulawesi. The villagers face severe enviromental degradation in form of mangrove deforestation. Climate change impacts such an increased number of flood, high tides, sea level rise, high waves, long and strong winds especially affect the fishery. The fishponds were distroyed by the strong waves and there are fewer fish near the coast, leading to less income for fishermen. Farmers are also impacted by climate change: prolonged dry and sudden wet seasons lead to crop failure. 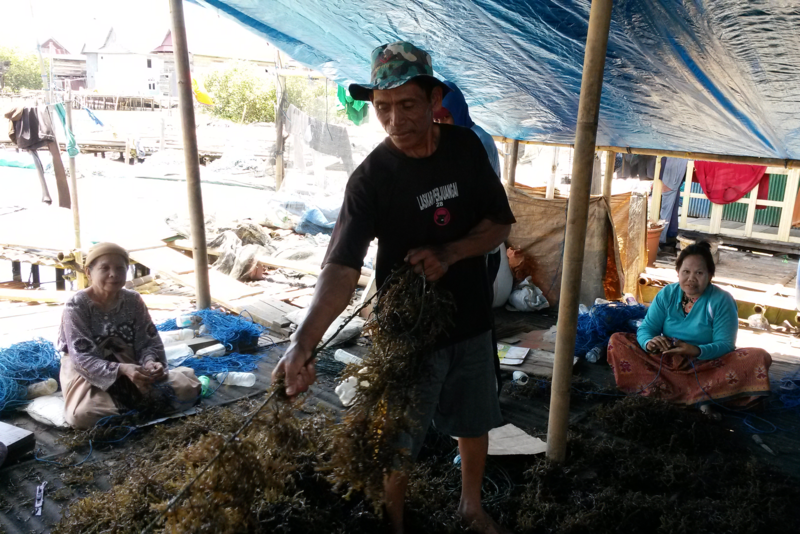 Knowing that their source of livelihood is threatened communities looked for other income opportunities and decided to start with seaweed cultivation, inspired by surrounding villages. CARE project staff and governmental and community representatives conducted a “Climate Vulnerability and Capacity Analysis” to gain information on climate change impact on livelihoods and existing adaptation strategies in target communities. CARE applied participatory rural appraisal tools such as historical timeline, hazard map, vulnerability matrix, seasonal calendar and Venn diagram. Additionally CARE facilitated a “Village Vision Mapping” process in which the stakeholders identified the current situation in the village, developed an ideal state of their village and strategies to achieve these ideal conditions. Based on these findings, adaptation projects with communities and local government were designed. A feasibility study was conducted to ensure that interventions are climate smart. Additionally, local government was trained in budgeting to be able to integrate best adaptation practices into development plans. Experiences are shared among Indonesian and Thai stakeholders and CARE staff to increase knowledge. The community started the seaweed cultivation by implementing techniques which they adopted from neighbouring villages in 2009. They started to cultivate seaweed as learning by doing without any guidance. As a result of the CVCA and the village vision planning the community wanted to focus on the improvement of seaweed cultivation. A technical expert, hired by CARE conducted a site survey and gave recommendations regarding location, timing, seaweed type, cultivation and post harvest treatment. After training on this, the seaweed-farming group started to cultivate seaweed on a demonstration field whereas they applied the conventional method on their own fields. This enables a direct comparison between the two techniques. Communities started to adapt by themselves. Existing approaches were improved together with all stakeholders to gain better results and gain knowledge. The government was involved in regular monitoring activities to get familiar with the method and to see the results of the new methods compared to the traditional ones. In case of success it will be easier to convince them to allocate budget for this in the next fiscal year. The good results from the new cultivation technology in the demonstration plots motivates the community to continue with the activities as they can witness the results. This document provides guidance on developing local level indicators for climate change adaptation from the perspectives of children and their communities. This participatory learning-tools handbook provides a comprehensive overview of community-based adaptation to climate change, and what is meant by 'good' participation. A pilot project using the BRACED Handbook, this case study describes the natural disasters being experienced in the Bay of Bengal, Myanmar and the community led interventions being implemented. A handbook developed to assess the the underlying drivers of vulnerability in communities and what kinds of climate extremes and disasters (e.g. rapid or slow onset) communities are exposed to. This poster is one of the posters featured at the CBA9 conference 2015. For more information about CBA9, visit: www.cba9.org.